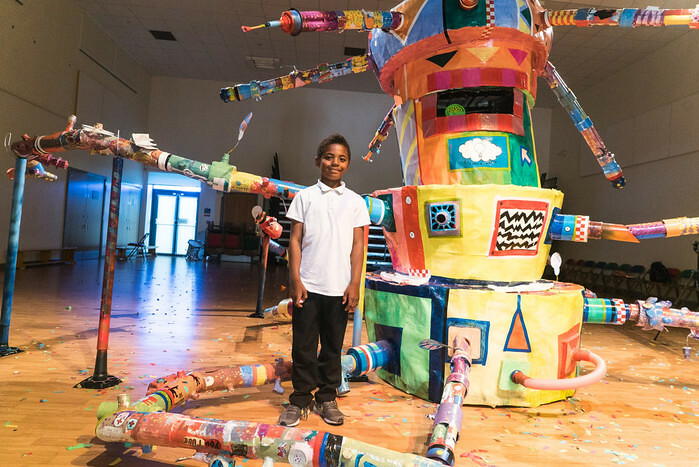 Celebrate the creativity of the city’s future artists, innovators, makers and rule breakers! Since 2016, No Limits, Hull 2017’s Learning & Participation Programme, has been unleashing culture and creativity in schools across Hull. Taking risks never seen in the classroom before, students became artists, performers and innovators, creating work in close collaboration with a collective network of creatives and their teachers. These wide-ranging arts projects engaged the next generation in 365 days of transformative culture, nurturing their own creativity and artistic thinking. LIMITLESS is a culmination event showcasing Hull’s young creative talent and a variety of work from art, film, performance and poetry all created with participating schools as part of the learning programme. This joyful and colourful celebration demonstrates that there really is no limit to what young people can achieve. Specially curated with schools taking part in the programme, we’ve turned a disused building into an awe-inspiring creative environment with a pop up café, gallery, cinema, library, workshop and studio. Here you will find creative organisations working within the space and through workshops and activities you’re invited to experience learning without borders. So, come in, explore and be amazed at what happens when you nurture the creativity of young people! What does the future of learning look like in Hull? Je Ahn Director of Studio Weave will present the Learning Without Borders vision on 7 December at 12 noon. Listen and then explore his vision in our live learning zones. After all your creative endeavours don’t forget to refresh and revive yourself with a home-brewed cuppa in our café, led by Two Gingers Coffee House. Sit back, relax and get comfy in our cinema which will be rolling film footage throughout the day to tell the story of some of our No Limits projects. We’ll be screening A Trawl through Time, an animation created by Bricknell Academy, to what happened when Northcott School received their Freedom sensory box and much more! Hull Libraries will join us as we host a pop up library and programme of activity. Hull School of Art and Design will also take up residency on 5 December to run their cultural conversations. Here you can cast your eyes on Hello Hull, Hull’s very own learning magazine, or be amazed by the talent of Hull’s young people, by picking up a copy of First Story. LIMITLESS will be open to the public from 12 noon until 9pm from Fri 1 Dec to Wed 13 Dec 2017. However, the doors to LIMITLESS will open to schools in advance of the public from Mon 27 Nov. Over the course of next week, you can arrange to pop in anytime between 12 noon and 6pm. Born into a City of Culture? It’s time to celebrate.